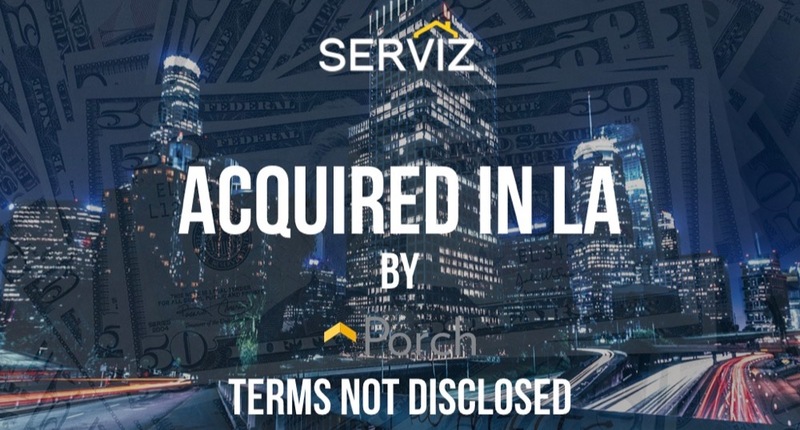 Sherman Oaks-based SERVIZ, the discovery platform for finding service providers for homes, has been acquired by Seattle-based Porch, another similar platform for finding home professionals. Terms of the transaction were not disclosed. Founded in 2014 by Michael Kline and Zorik Gordon, SERVIZ had raised $20M in funding over two reported round with its last round a Series B in late 2014. Investors in the company include Sutter Hill Ventures, PointGuard Ventures, Jeff Stibel, and Zorik Gordon. Porch was founded in 2012 by Eric Schleicher, Ha Phan, Matt Ehrlichman, Ronnie Castro, and Scott Austin and has raised a total of $98.9M in funding over three funding round with the last funding a $65M Series B round in early 2015. Backers include SV Angel, Battery Ventures, Founders Fund, Fabrice Grinda, FJ Labs, Capricorn Investment Group, Valor Equity Partners, Geoff Entress, Panorama Point Partners, Bill Lee, Charles Moldow, T. Trent Gegax, Lowe’s, Javier Olivan, Jeffrey S. Skoll, and Ty Pennington. This marks the third acquisition for the company, having previously acquired Fountain Software in 2015 and Elemental Foundry in 2014. Porch plans to use the SERVIZ brand name for now and Zork Gordon will not be joining the Porch team but the 50 person LA team will remain as will the office.